I think I like the last one the best. But the second is pretty amazing too! yummmmmmy...i Love the chandelier cake! the last one is amazing...love the silhouettes! The third one is my favorite. It looks like stationery! My jaw just dropped at these cakes. No joke. Love them! Beautiful and delicious I'm sure! Stopping by for the June Comment Challenge. 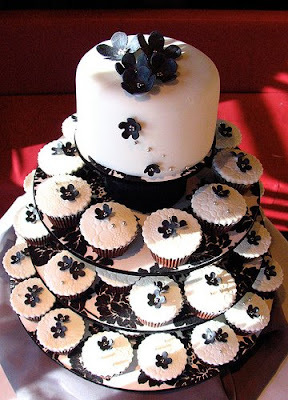 I love the 1st one I'm into cupcakes, going to have them for my Wedding cake!! I especially love the 3rd cake, it is so cute. I love that last one - so simple but amazing! I love the cupcake cake best! I don't think I'd ever be able to eat it though-it's too pretty! Jen the last piece of cake looks like pure art. And don't bother slicing me a piece with tea. Just give me the top slab. I didn't get to 217 pounds by eating carrots. Oh wow, those cakes are fabulous! I love the first one! These are so lovely! I like the black and white combo. I love that first cake! Absolutely gorgeous! 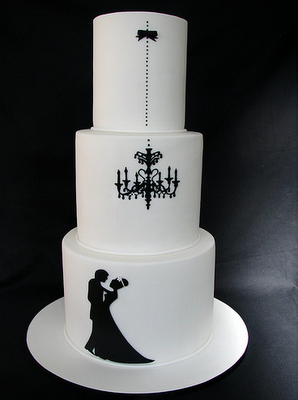 If I could redo my wedding, I think I would have considered a black and white theme. Stef, I love those cupcakes you linked!